Order in the next 3 hours, 17 minutes an 3 seconds for same day shipping. This set of 2 diamante wine glasses with modena spiral cutting is the perfect gift to give to your employees who have one awards for excellent service. To create your personalised wine glasses, simply enter the details you want to see on the glass in the fields on the right and we will create the design for you. You can also upload graphics to be engraved on the glasses. They will be expertly engraved with our specialist laser machines and are delivered in a blue presentation box. Size of engraving area: Height: 50 mm, Width: 55 mm. 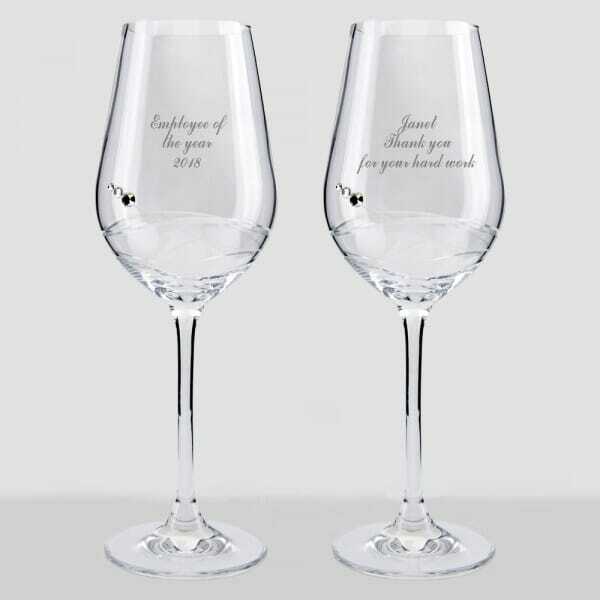 Customer evaluation for "Personalised Employee Recognition Wine Glass Set"